I love a purist. When I buy kit I want it to be the offering of those obsessive designers, who create trends that get the ultimate kudos of being copied. That's why I love Velodyne – for its approach and its purity. A company run by utter bass heads. Like rival brand REL, Velodyne is blessedly bonkers and truly 'gets' bass in the same unashamed way. No pathetic mutterings about 'where music finishes', but sheer, unadulterated delight in lows that drop deeply, with powerful, room-inflating might and a literally visceral kick in the intestines. That's the level of performance you get from this CHT-15Q subwoofer. I played some surround tunes from early nutty DVD-A DTS discs and Will Smith's Hancock on Blu-ray. With the latter, the huge impact of a train being stopped on the spot, followed by the basso rumbles as two miles of moving freight pile up in the distance, were wonderful. Meanwhile, music was tracked deep and with grip. The CHT-15Q is filled with Velodyne's very own design of driver and from a range priced like family cars rather than Bentleys. The company do make awesome top-end subs in the DD range but these CHT-Q models, running from 8-inch to this still compact design with a 15-inch dustbin lid in it, are far less costly. Structurally it's quite simple, with classic slot porting built into the enclosure. But it has a neat control system with self EQ-tuning via a supplied microphone. The auto-EQ really does prevent crass hooliganistic boomy settings, even for the hard of thinking. 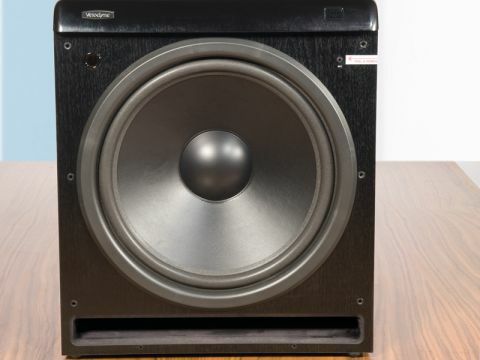 This has to be a piece of the cost, yet this is the biggest CHT-Q sub, with three quarters of a kilowatt of horribly efficient Class D amplification inside, and still retails for only £1,200. So it's considerable value for money. If this behemoth is too big, you can get it in three smaller sizes. If it was a car, it'd be a Volkswagen Sharan people carrier – big, affordable, roomy, well-made, durable and solid... but with a V6 engine.